Check back occasionally and scroll down to catch up on any news items, announcements, specials, whatevahs! 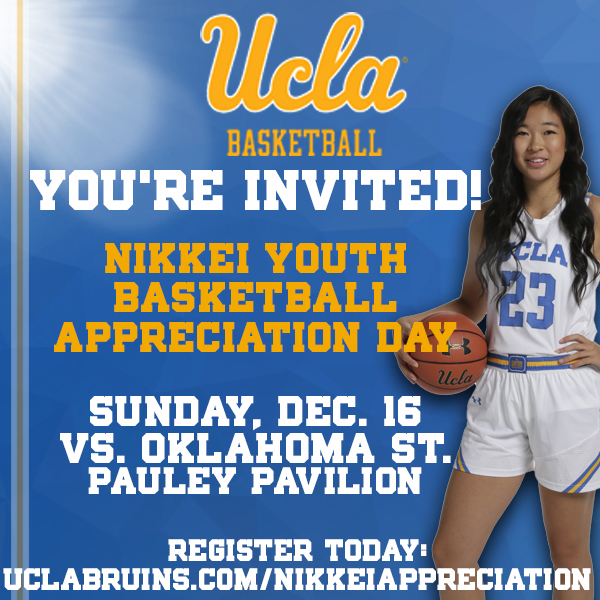 I'm very happy to announce that the UCLA women's basketball team will be hosting its 2nd Nikkei Youth Basketball Appreciation Game this year! They were so impressed and appreciative of our community's turnout last year and are very excited to welcome us back for another game. This year's game will be on Sunday, December 16th at 2pm at Pauley Pavilion. The UCLA women's team, who are coming off an Elite Eight finish in the NCAA tournament last season, will be playing against Oklahoma State University of the Big 12 Conference. This is open to boys and girls teams of ALL ages (K-12), from all organizations. All of the extra perks are for a limited amount of players, so sign up quickly! Teams who would like to take advantage of this opportunity will get more information after signing up. You can sign you team up for this special event here: www.uclabruins.com/NikkeiAppreciation. As I mentioned earlier, the team loved having us fill Pauley last year and it would be great if we could get another big turn out! If you have any questions, please contact the women's basketball Director of Marketing, Dana Mayeron (dmayeron@athletics.ucla.edu). Thank you for your support, and Go Bruins! Mario Qua holds Wilson Qua as they evacuate their flooded home after the area was inundated with flooding from Hurricane Harvey on August 27, 2017 in Houston, Texas. From the Palm Beach Post. The Gardena Chamber of Commerce held a Drive through—Drop-off on Saturday, October 14. Many thanks to a fine group of Tigers who sorted and repacked a variety of items left over from previous Tiger Tournaments. A special thanks to Dwayne Shoji of StudioEffects for taking the boxes to the drop off area. Thanks to Dwayne at Studio Effects for bringing the boxes of Tigers donations to the drop off area where Tiger volunteers unloaded and sorted them into labeled bags. Go Tigers! A big shout out to the Speed, Jedi, Swish, Sparkles and Warriors for representing the Tigers! A special thank you to Lisa Maeda for coordinating the effort.